High Voltage Technology Demonstration Satellite HORYU-II is a Nano-Satellite (30cm cubic shape, 7kg) being developed by the students in Kyushu Institute of Technology. One of the objectives of this satellite is orbital demonstration of forthcoming space high-voltage technologies. There are two major points in the development concept of HORYU-2. The first point is that the satellite development is carried as a part of official education program of KIT graduate school, (Training of Project Leader Type Doctor Engineers -ProST). The aim of the ProST is to train graduate students to be active as a leader through a project-based learning program. In the program, a group of student made of various majors forms a team to develop a system. In the system development, the student will experience the whole processes of system development from conceptual design, testing to operation. The students learn the project management, acquire systems engineering thinking and improve the communication skills through the projects by applying various systems engineering practices to their project. In HORYU-2 project, students make project documents such as Requirement Allocation Sheet(RAS), Work Breakdown Structure (WBS) and Integrated Master Plan (IMP). By setting schedule milestones such as technical reviews, risk management and others, they manage the schedule. Students also make Interface Control Document(ICD) to coordinate the interface and share the design information. 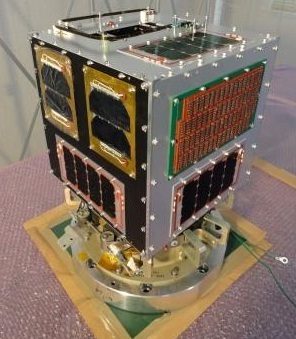 The second point is its mission, on-orbit demonstration of new technologies developed at KIT in the area of spacecraft environmental interaction study, which is the major feature of KIT space engineering research represented by the Laboratory of Spacecraft Environmental Interaction Engineering. A nanosatellite is suitable for timely demonstration of new technology in orbit that is difficult on a medium or large scale satellite. The main mission of HORYU-2, 300V power generation in space, is especially difficult to do on larger satellite as the risk of electrostatic discharge is feared by a satellite developer or other people who have their mission payloads on the same satellite. Die empfangenen Daten können als ASCII File eingelesen werden oder auch ganz einfach mit copy and paste in das obere Textfenster kopiert werden. Es ist unerheblich, ob Leerzeichen zwischen den Zeichen vorhanden ist. Wichtig ist nur, dass jeder Telemetriesatz in einer eigenen Zeile steht. Die einzelnen Telemetriewerte werden wie immer in gewohnter Weise angezeigt. The satellite with the highest voltage generation in Low Earth Orbit has been ISS, generating 160V. On orbit, especially LEO, high-voltage (over about 200V) generally induces electro-static discharges (ESD). HORYU-II is aimed to demonstrate new designs of solar array that can generate power, free of ESD, by producing 300V via a specially designed solar array itself, not via a conventional DC/DC converter. If successful, HORYU-II will become the first spacecraft in the world that achieved 300V photovoltaic power generation in space. The high-voltage solar array consists of spherical solar cells made by Kyosemi Co., Ltd. The generation voltage per spherical solar cell F12 module (spherical cell module) is approximately 7V (open circuit voltage, room temperature). HORYU-II mounts two high-voltage solar arrays connected in series.